The ADA covers employment, access to goods and services, and State and local government programs, activities, and services. There are other Federal disability rights laws that cover housing, air travel, telecommunications, Federal programs and services, and other topics. For more information, see the Department of Justice publication called "A Guide to Disability Rights Laws." 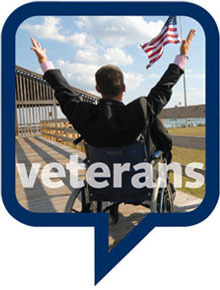 You can read or download a copy at https://www.ada.gov/cguide.pdf or order a copy from the ADA Information Line. See Contact Information. You've been seriously injured while serving on active duty in the U.S. Military -- perhaps you've lost a limb, sustained a traumatic brain injury or spinal cord injury, sustained hearing or vision loss, or are experiencing post traumatic stress disorder (PTSD) - and now you're back in the States trying to adjust to living with your injury. This publication explains your rights under the Americans with Disabilities Act (ADA) and provides information on where to get assistance. Andrés Perez lives with PTSD and TBI, and his service animal Smoke allows him to have a better quality of life. 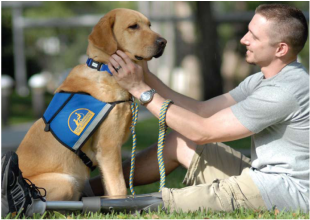 Honor veterans for their service by honoring their right to have service animals. Learn more about the rights of service animal owners, PTSD, and check out our latest podcast with another veteran with invisible wounds on our blog. Watch the video now, and share it with your friends. New! 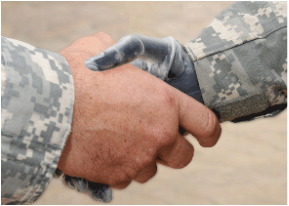 CDC Report to Congress on Military-related TBIs, click here.